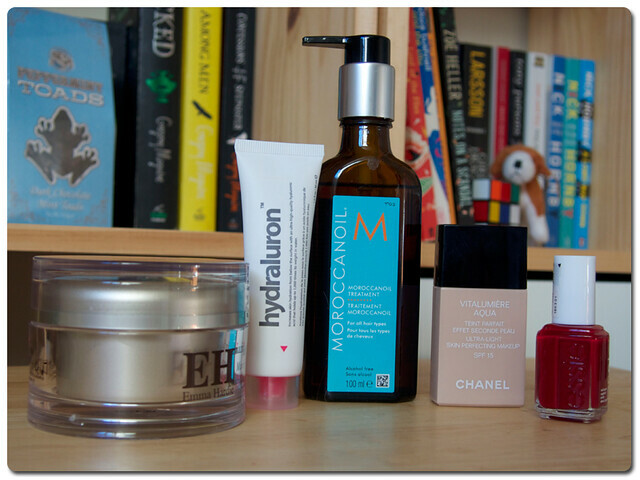 I thought I would share with you a few of my favourite beauty products of 2013 today. I haven't reviewed many beauty products over the past few months because I haven't actually used very many new ones, but a few have snuck into the collection here and there so I thought it might help to do a very small round up of which ones have stood out to me. This one I have mentioned in a skincare routine post, and with good reason, this stuff is like gold to me, and has been my staple cleanser since I first tried it mid-way through the year. Since I started using this (in combination with a few other products) my skin has been looking much brighter and healthier. I have managed to pin point this down to being the most effective product of the bunch because I stopped taking it with me when I travelled and usually ended up quite congested with some minor breakouts which were quickly resolved when I went back to using this. This is my little bit of luxury to smooth over the skin day and night and then buff off with a flannel. This stuff is amazing! This one I first tried earlier in the year and didn't really notice much of a difference. As a result I stopped using it for a bit whilst trying out a Dr Jart+ serum, but I have gone straight back to this recently. Packed full of hyaluronic acid it makes a huge difference to how hydrated my skin is. This isn't one of those wow products that you feel working straight away, it is more a case of you feel the negative effects if you aren't using it. Smoothed over my face before my moisturiser, I won't be going without a serum again after trying this. I first started using Moroccan Oil in the early parts of 2013 after buying a little trial set in my hair dressers. I had used a wide array of hair serums before but not religiously. I have naturally very straight hair and if I am completely honest I don't desperately need a lot of products. Throughout the middle of the year though when I was allowing my hair to grow really long this bottle of golden liquid became somewhat of a staple. It smoothed my stressed tresses, and helped the huge weight of hair dry faster after washing. It has become my must have for easy natural hair, I just smooth a half pump throughout damp hair and let it do its thing. Easy! I have been wanting to try this foundation ever since it exploded onto the beauty scene back in 2011, but had promised I wouldn't buy it until I had used a few other products up. Well with empties this year came treating myself to this bottle of wonder. I was skeptical at first, Chanel is known for being lightly fragranced and an irritant to some skins, and I have to admit I have never worn this day after day so I don't honestly know if I would react to it, but as my special occasion face makeup this has been wonderful. I use about a 5 pence piece amount, and blend it over my face with my fingers for when I need a little more coverage than a BB cream, and it really does simply look like skin. Beautiful. The stand out brand for additions to the collection this year has to be Essie. I have added six of their polished to my already far too large collection, and they have all been diffusion line shades. The new brush combined with the already gorgeous easy to apply formula means that these are a dream to apply, and being able to easily grab them when in larger Boots stores has helped too! These are definitely my favourite brand of nail polish now, with my personal favourite shades being Fishnet Stockings for the autumn and Cute as a Button for the summer. What were your favourite products of 2013?